When I posted about the whitetail bucks in our neighborhood a few weeks ago I mentioned that this one was limping and missing an antler. Readers had a few questions and concerns. I spotted him running through the yard a few days ago so he's doing just fine. Another question is about recognizing individual deer. 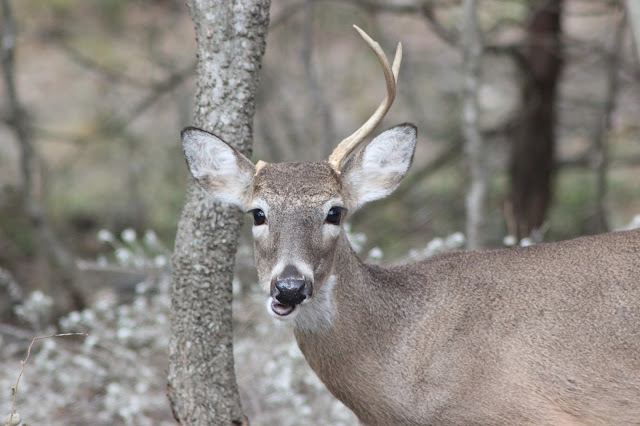 We do recognize them if they have a distinguishing feature like one spiky antler or if they follow a pattern by appearing at the same time each day. Sometimes we even name them so we've decided that since he's a "half-buck" we'll call him 50-Cent which will last until he loses the other antler. The comical expression might still give him away after that. No word on a recording contract yet. I received a question about my fancy wheelbarrow shown in my previous post on this year's topsoil delivery. It is indeed fancy since it has two wheels, stabilizer bars, implement holders, and even dual cupholders -- you might say it is a "loaded" wheelbarrow, although it could use a GPS sometimes. My wheelbarrow is new since spring 2012 when we moved a truckload of topsoil and I had trouble controlling the traditional single-wheel model. After a couple "incidents" with tipping over on turns last year, I decided to find one better suited for my needs. 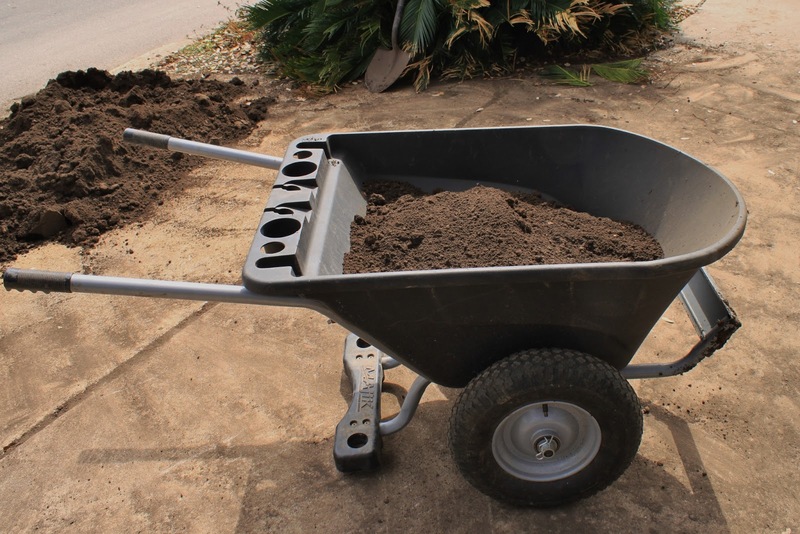 I went with the Majik wheelbarrow from Sam's Club and it's a lot more stable which made moving topsoil and just about anything else much easier for me this year. Sixteen Tons and What Did We Get? -- Topsoil! We also had our work cut out for us this past weekend. 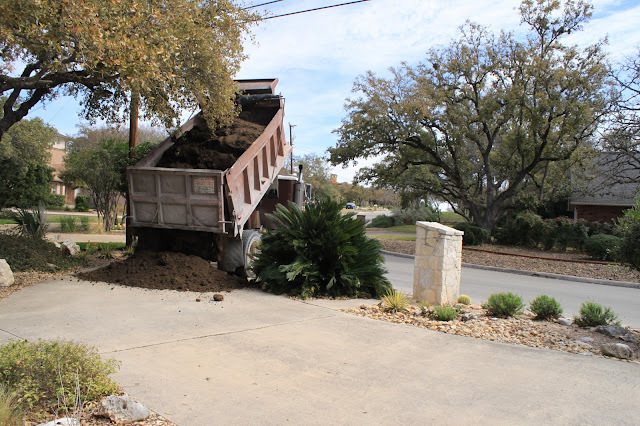 A yard of topsoil weighs in at just over a ton and last Friday we had approximately 14 yards of topsoil delivered to our driveway. We estimated the weight to be about sixteen tons. 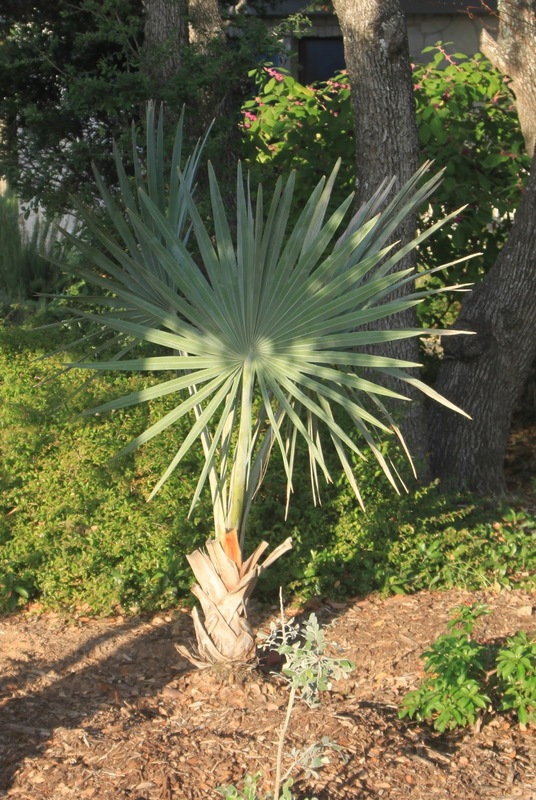 A few posts back I mentioned one of the two Bismarck palms in my yard had been "antlered" by a deer and I was both surprised and touched by the expressions of concern for the plant. The damage was superficial and mostly affected older fronds. The crown was not damaged so I'm sure it will make a full recovery--eventually. On my return trip from Austin I avoided the crowded interstate and headed west on US 290 into the Texas Hill Country. My route took me right past Vivero Growers near Dripping Springs so of course I had to stop for a visit. The vignette by the office near the front caught my eye immediately. Gorgeous colors! I've been planning to add a bright color to my garden and orange is emerging as the front runner. The talavera pot looks so fresh here. When I learned that Pam Penick's first Lawn Gone! book presentation would be at The Natural Gardener I was thrilled. 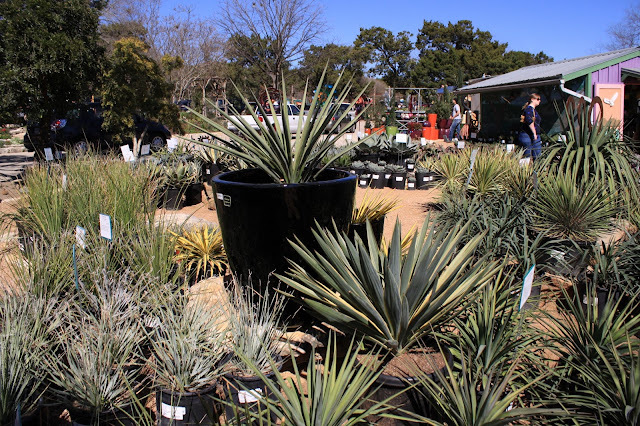 Not only could I attend, but it was an opportunity for plant shopping at a great nursery which has been on my "must-see" list for several years. After the main event I headed out to explore the grounds of a legend in the world of organic gardening. First to the agave, yucca, and succulent display area. This beautiful array of spikiness made me catch my breath. 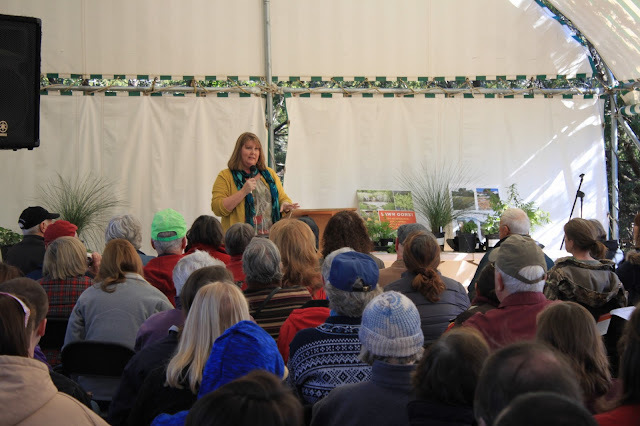 It was standing room only at The Natural Gardener in Austin yesterday as Pam Penick, local author and award-winning blogger at Digging, discussed her new book Lawn Gone! which was released on February 12th. The audience was in for a treat as she is both entertaining and informative. Pam had their attention as she discussed trading in the traditional lawn in favor of options covered in the book such as groundcover, perennials, and hardscape. For Foliage Follow-Up, sponsored by Pam at her blog Digging, I'm focusing on winter foliage in my front garden. At this point in the winter is when the work we've done over the last few years pays off in the front garden. It's also the time when the garden is at its dullest. It's not so dull this year. The driveway plantings were completed last summer with year round interest in mind. The salvias aren't blooming but they are green so it looks good and not too different from any other season of the year. It's Garden Blogger's Bloom Day (GBBD) and my garden has a few blooms to show for February. It's been a mild winter so far and we've got about a month to go. Kalanchoes brighten the sill outside the breakfast room. Next year I'll plant them in all three succulent baskets for winter blooms. These are covered when we get a cold snap. What's softer than a Teddy Bear and sticks around longer than candy and cut flowers? 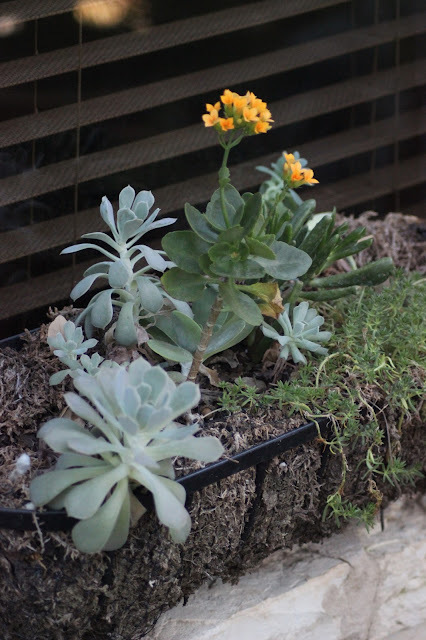 Kalanchoes! It was plants again this year for Valentine's Day. Fuzzy ones. 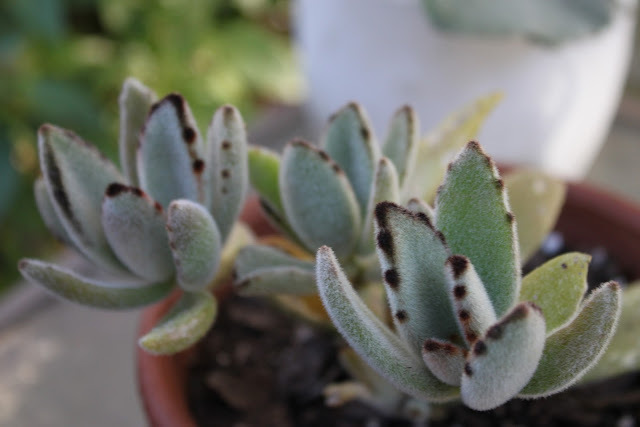 Kalanchoe Tomentosa, those dark leaf edges are so distinctive. Check another project off the list. 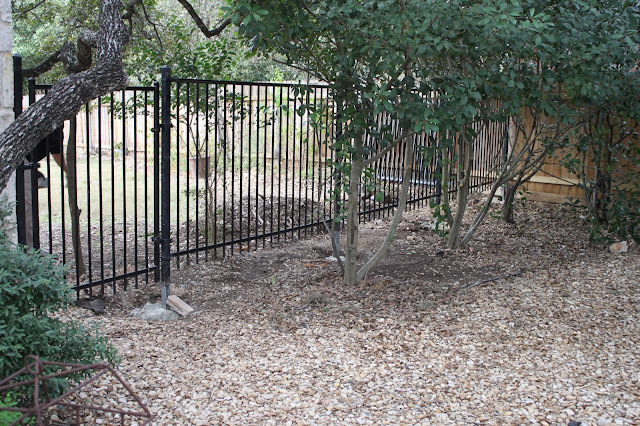 We installed a fence across the north side yard over the weekend. 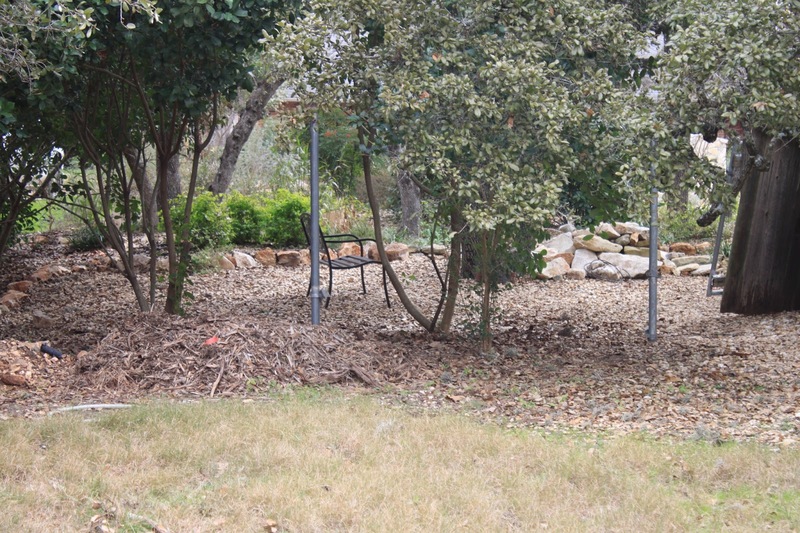 This sets up a space to build new planting beds along the fence in the front and back yards, which is why the fence panels are raised off the ground about 10 inches. The "new" steel fence was purchased off Craigslist in excellent condition because the family installed a pool and needed a privacy fence. We have found so many good deals on Craigslist. 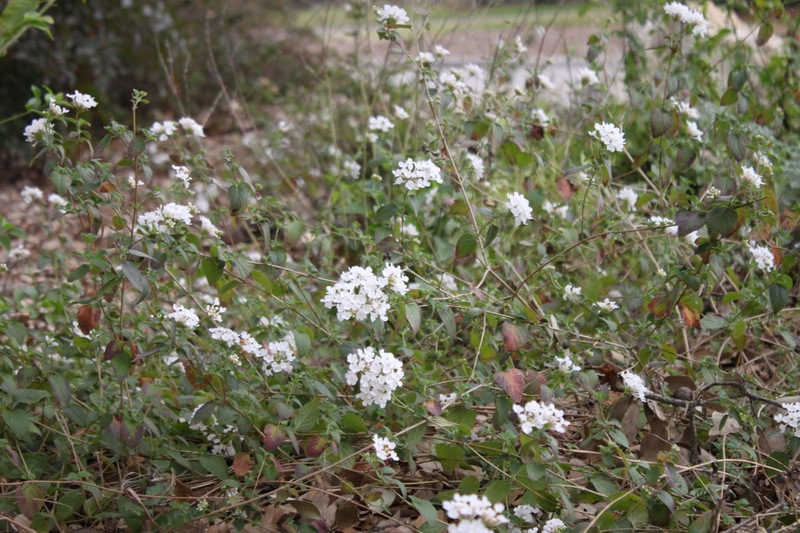 A mild winter with above-average temperatures means some plants have continued to bloom in the garden this February. 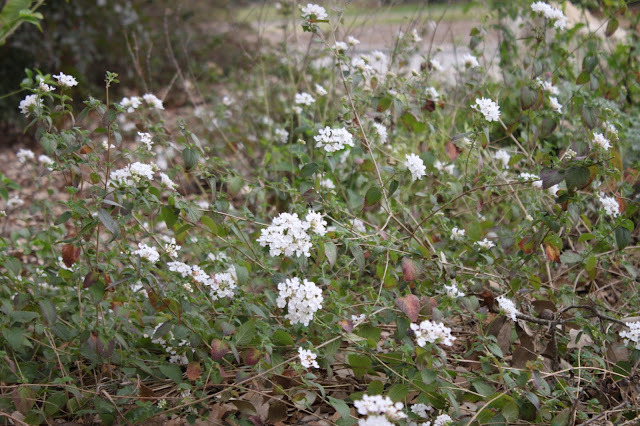 White lantana has not gone dormant this year and is covered with blooms this week. 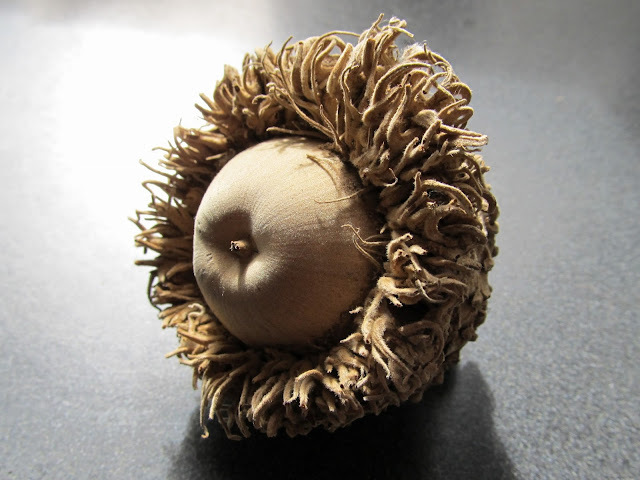 At first glance it doesn't even look like an acorn because it is so large and unusually shaped. Up in Pennsylvania the big news is all about Punxsutawney Phil and his Groundhog Day prediction of an early spring. When I was growing up in sub-tropical Houston I thought it was an odd story and wondered why anyone would want winter to end early since our February weather was pretty nice. The rare snowfalls and icy days we experienced seemed like fun to me and a nice break from our typical heat and humidity. I married a Pennsylvanian, learned to drive in bad weather and spent the next 30 years in very cold places like the upper midwest and New England before returning to Texas for good a few years ago. 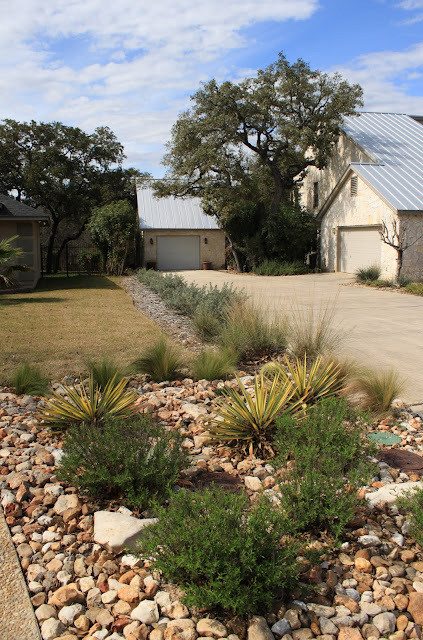 Groundhog Day in San Antonio means I'd better get busy and finish my big garden projects because it will soon be too hot to build new border beds or a fence. Our record high for February is 100F/38C and the low is 4F/-15.5C, not in the same year but it could have been. 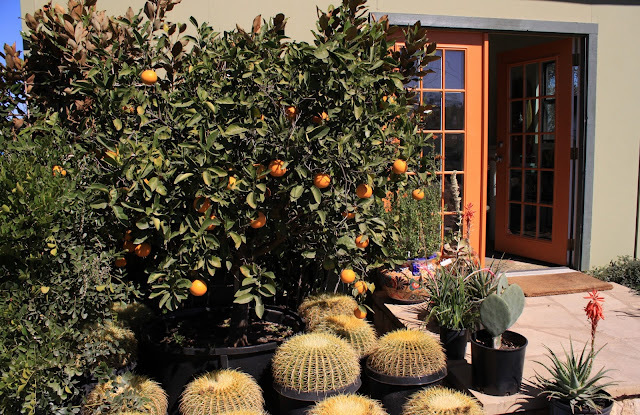 In the summer the trend reverses because by July gardeners up north will be out enjoying their gardens and we will be focused on indoor projects to beat the heat. We have two large projects on the spring agenda this year. First up is replacing the fence on the north side of the house and extending the perennial border around the buffalo grass lawn in the back yard. The old fence was removed earlier in the week and we'll be out there soon putting in the new one. We'll enjoy this view through to the front yard with the open fence while the trees make it quite private on this side.